V and F Sheet metal have installed off line software from Trumpf to aid the programming of their Trumpf 7036 press brake. The Trubend software has the ability to take data both in 3D and 2D formats directly from our customers or from our own Radan 3D modelling system, this enables us to check out jobs for bending problems before starting sheet metal production. 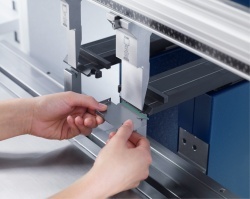 Selecting the correct tooling and the most efficient bend sequence will enable us to reduce cycle times and keep your costs down when quoting you for your new sheet metal parts. Once again V&F invest in equipment from the sheet metal industry’s leading machinery maker Trumpf. Our brand new Trumpf 7036 press brake will help reduce set up times when bending small components (up to 1m long), enabling us to produce components more economically and with shorter lead times. This investment will help you to keep your costs down when sourcing sheet metal parts from V&F. Since this post was originally published we have added a second Trumpf 7036 CNC press brake giving us plenty of CNC bending capacity in our new Fareham factory in Hampshire.